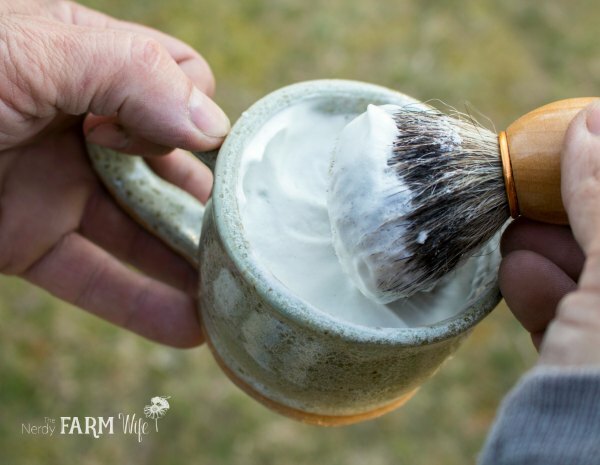 It includes both sodium hydroxide and potassium hydroxide, plus has a high amount of stearic acid in order to produce a dense lather that’s perfect for shaving. 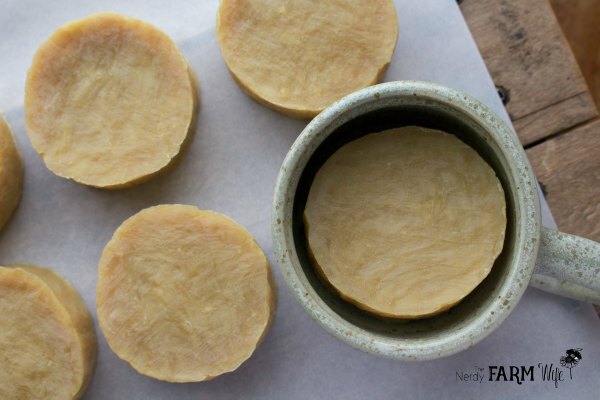 Most shave soap recipes rely on soy wax or stearic acid flakes to meet the criteria for stearic acid amount, but I prefer making shave soaps without either of those two ingredients, so instead rely on kokum butter, which contains 56% stearic acid. It took a lot of experimenting and failed batches to get the basic shave soap to turn out to my satisfaction (and more importantly, meet my husband’s approval too), which is why I don’t recommend changing up any of the oils and butters in this recipe, without first reading the accompanying article on how to create your own shave soap recipe. Purchase both sodium hydroxide, such as Red Crown High Test Lye or ComStar Pure Lye, AND (90% purity) potassium hydroxide, such as Essential Depot or Bramble Berry brand. Infuse the coconut oil with calendula flowers, following the quick infusion directions in this post on 10 Things to Make with Calendula. 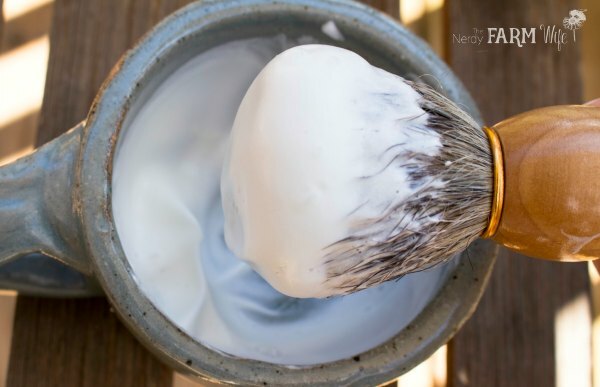 Shave soaps aren’t as complicated as they look, but you should have some prior soapmaking experience before trying this recipe. * For variety & enhanced lather, try replacing half of the calendula tea with coconut milk. Put on protective goggles and gloves. Sprinkle both types of lye into the cooled tea, one at a time; stirring until completely dissolved. Set aside. 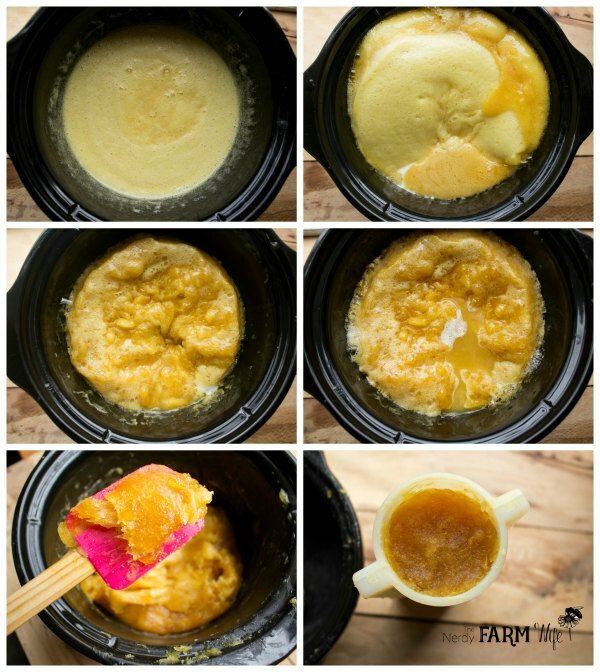 Melt the butters and coconut oil, then combine with the castor oil in a 2 quart slow cooker (crockpot). Cover the slow cooker and cook the soap, checking every 15 minutes, stirring if needed. Cook about 1 hour or until the soap is transparent and resembles glossy mashed potatoes when stirred. Turn off the slow cooker, remove the top and allow the soap to cool for a few minutes. Combine the vegetable glycerin and essential oils and stir into the cooked soap. Spoon and firmly press the soap into a column mold (I use THIS ONE) or individual round molds. Leave the soap uncovered for 24 hours or until cool. Remove from mold, slice into bars and cure for at least 3 weeks before using. * My crockpot runs hot, so your cook time may vary. Allow for an extra 30 minutes to an hour cooking if needed. Those with sensitive skin or noses may wish to leave this recipe unscented, adding the glycerin after cook time, without the essential oils. For a fresh touch of orange scent, try 18 grams of ten-fold (10x) orange essential oil + 12 grams grapefruit essential oil. Or, you may enjoy my all-time favorite shave soap essential oil blend of 5 grams cedarwood atlas + 2 grams clove + 2 grams vetiver essential oils. Feel free to experiment with other essential oil combinations, using my printable essential oils for soapmaking chart for reference if needed. For more soapmaking tutorials and recipes, check out my natural soapmaking resource page. 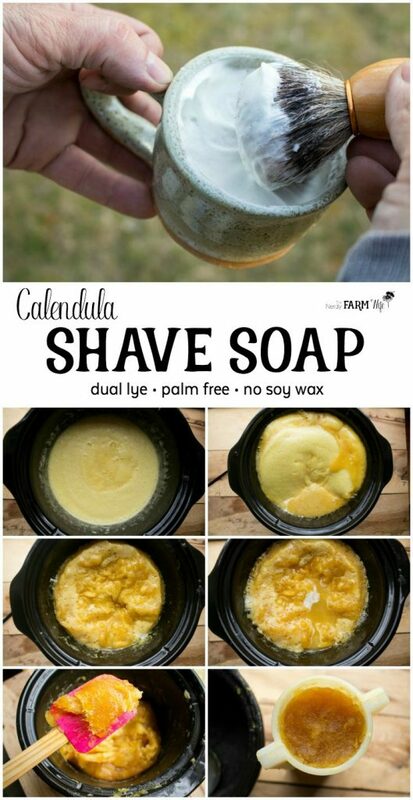 Did you enjoy this tutorial on making Calendula Shave Soap? If so, let’s keep in touch! Subscribe to my newsletter to receive my best natural soapmaking recipes, DIY body care tutorials and fun projects you can make with common flowers and herbs. Tagged calendula, shave, shave soap. Bookmark the permalink. I just placed an order for soy wax and thought I’d try making a shaving soap so I’m curious about why you chose not to use it. Is it that you like kokum butter or is there something else I should know? Hi Deeksha! Some of my readers don’t like to use soy wax because it’s highly processed, so I wanted to provide a recipe that didn’t include it. For myself, I don’t mind using soy wax sometimes if it’s a high quality, so I have more shaving recipes I’m experimenting with – some with soy wax in them. Stay tuned! Oh was I wondering how to use dual lye :) thanks for the info. Hello Jan ! I’d like to make this recipe following the exact same ingredients that you used, but I have one question and forgive me if it’s too obvious. I saw the image with the shaving brush and I thought that the final product would be a creamy frothy lotion. But I see now that it is in fact, a bar of soap that lathers when you add water? I’m confused please help. Any subs for kokoum butter? Cocoa or mix cocoa and stearic acid? How much of each %? Please and thank you never made this type of soap before. time you change up ingredients & I haven’t tried this recipe with anything else to know for sure of any exact amounts. Thanks so much, Jan, for this recipe. It’s what I’ve been searching for…I’ll be making my first shave soap! I just ordered kokum butter. =) I’m wondering with this recipe how many round pucks this made, and the approximate weight & dimensions of each? Thanks again! !